President Moon Jae-in on Thursday met with leaders of startups emphasizing their role in economic growth, and the government’s efforts to support them. Saying that his administration is seeking growth in innovation, Moon said that local startups will soon begin to benefit from regulation changes, and that the so-called “Korean Peninsula risk” is rapidly fading. “Once results are achieved through the regulatory sandbox, people will be able to see for themselves the difference between the presence and absence of regulations,” he said, in response to participating business leaders’ comments regarding the country’s regulations. According to Cheong Wa Dae, many of the seven participants raised issues with regulations hampering startups in Korea. The event was attended by representatives from seven selected startups, and those that have grown into unicorns -- startups that are valued at over $1 billion -- including Lee Hae-jin, Naver founder who currently serves as the company’s global investment officer, and Seo Jeong-sun, chairman of biotechnology firm Macrogen and the Korea Biotechnology Industry Organization. Regarding the widespread anti-corporate sentiments in South Korea, Moon said that such sentiments are rooted in the corruption of businesspeople in the early days of the nation, but such sentiments will soon dissipate due to increased corporate transparency. 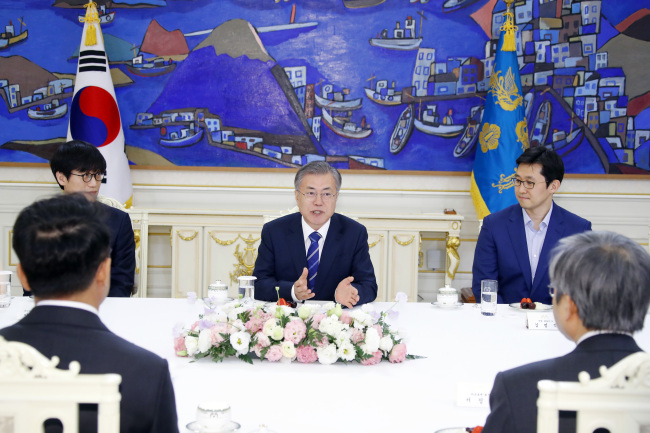 The presidential office also revealed that Moon plans to focus on economic and business issues in February. According to Cheong Wa Dae, a conference on smart cities will be held this month, and he will visit Busan as part of measures aimed at boosting local economies. Last month the president visited Daejeon and Ulsan where he met with business leaders and local government officials. In addition, a meeting between the president and small business owners will be held in February, Cheong Wa Dae said.